It's easy to understand why San Gimignano is called the Manhattan of Tuscany, as you approach the town you'll see what looks like a group of high rise buildings. Strange to encounter a contemporary urban skyline interrupting the hills of Tuscany. A closer view will reveal fourteen very old stone towers rising from a small medieval walled town perched on a hilltop. Now that's more like it. Piazza Duomo- San Gimignano, click on image for larger view. San Gimignano's position along the ancient road from France leading to Rome, Via Francigena, meant that this town enjoyed some very prosperous centuries. The towers are remains of these times, aristocratic families would build tall towers as displays of their wealth and power. During the thirteenth century, seventy two towers stood over the town. A plague killed more than two thirds of the population in 1348, soon after, Florence took control of San Gimignano and many of the towers were destroyed. A long period of decline followed, with a second plague and poor economy, not much growth in this town for many years. This meant that much of the original medieval architecture remained untouched. Today, the town's historical center has been restored and declared a Unesco World Heritage site. Always bustling with tourists, San Gimignano is a great spot for people watching. I shot the panorama below in Piazza della Cisterna from my seat in the cafe while sharing a slice of tiramisu with my better half. It is a series of 12 photos I stitched together in Photoshop. I love how panoramas like this capture the movement of the crowd. So many stories told in a single image. Piazza della Cisterna - Click on the image for a larger view. Tiramisu is Italian for 'pick me up', and this dessert delivers on its promises. 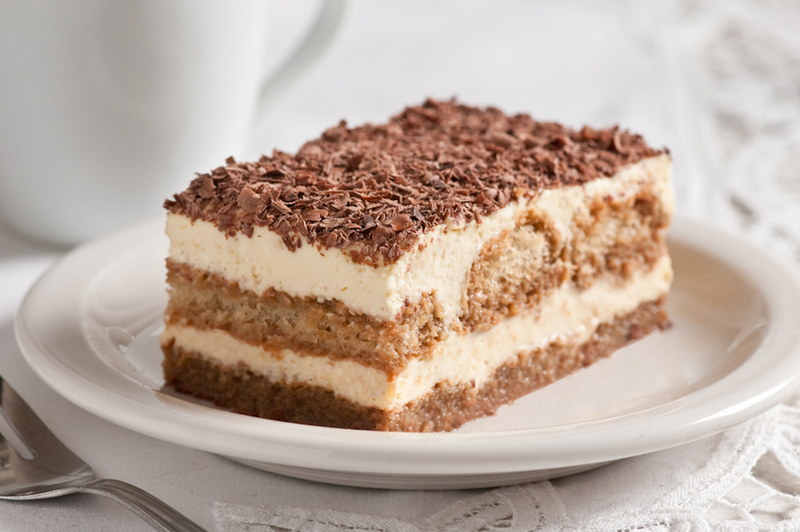 Lots of caffeine and a little booze with a decadent creamy texture, a few bites of tiramisu can really elevate your mood and improve your general outlook. Parking in San Gimignano is a nightmare, so by the time we found our way to the piazza, I was more than ready for a little 'pick me up'. I wish I had known how easy it is to make, I'd have tried it sooner. Until quite recently, I'd never actually made a tiramisu. I've eaten zillions of them, but never made one myself. So, after reading lots of recipes, I discovered there are several different approaches to the mascarpone component. Seems there are two major schools of thought when it comes to the eggs in tiramisu: the mousse sort of approach, using raw eggs and whipping the whites or the custard approach making something akin to zabaglione using only the yolks. Of course, I had to make a few test batches, for the sake of science and all. Both methods produced really good tiramisu, the mousse method with the raw eggs was lighter and airier. The custard method produced a richer tiramisu, which seemed to improve with age. I polished off the final morsel four days after I'd made the dish and the last piece was twice as good as the first. So, the custard method wins. Beat yolks, Marsala and sugar in a metal bowl over a pot of barely simmering water until the mixture is pale yellow and almost tripled in volume. Use an electric mixer on medium high speed; it will take between 5-8 minutes of constant beating to achieve the desired consistency. Remove from heat and allow to cool for a couple of minutes before adding the mascarpone. Stir the cheese in gently, just enough to incorporate. In a separate chilled bowl, whip the cream with 2 tablespoons of sugar and vanilla extract until soft peaks form. Then, fold the whipped cream into the mascarpone mixture carefully, being careful not to deflate the whole affair. To assemble, mix espresso and liqueur in a shallow bowl, and dip Savoiardi into the mixture briefly one at a time. Don't let them soak too long, or they will turn to mush. 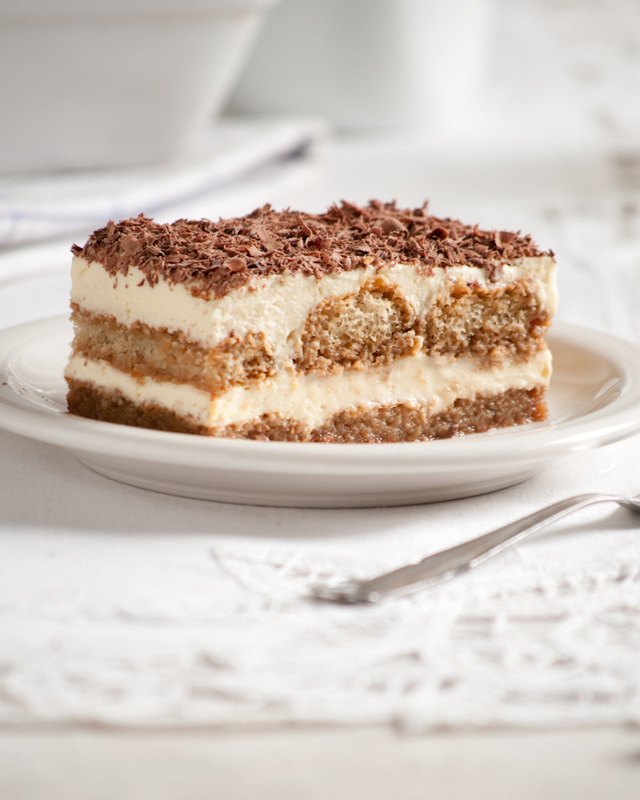 Arrange a single layer of the lady fingers in the bottom of a 9 x 9 dish, follow with a layer of the mascarpone mixture, and then another layer of espresso soaked lady fingers, followed by a final layer of mascarpone. Grate the dark chocolate over the tiramisu to finish.